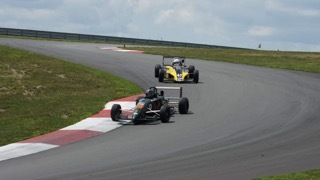 Formula Continental is a single seat, open wheel racing class, typically competing under SCCA sanction. Traditionally, it includes three types of cars. The first are the traditional 1100cc Formula C cars (which have large wings, are allowed aerodynamic tunnels, and full race engines). The second type is the Formula Ford 2000 (FF2000), which is a flat bottomed, steel tube frame open wheel car with smaller wings and a 2-liter engine derived from the steel blocked Ford Pinto or Ford Zetec engine. The third type is the air-cooled variant of the Formula Super Vee, which used a 1600cc Volkswagen engine. Currently, the vast majority of Formula Continental entrants are FF2000 cars, and it is these cars that have a home with the Great Lakes Championship series, competing classed as an FC or a Club FC, with the distinction of 'Club' level cars being manufactured up to and including 1995 and powered only by the Ford 'Pinto' engine. These cars weigh in at 1200 lbs with driver, and around 150 horsepower. This remarkable power to weight ratio allows for sub-four second 0-60mph acceleration, phenomenal braking performance, and cornering capabilities of more than 2.0g. This is enough to be amongst the very fastest cars to lap any track, on any given weekend. Affordability of the tube-framed cars, along with their inherent repairability and maintainability has made this class very approachable for most racers. A typical season budget for a skilled do-it-yourself driver/mechanic averages 12-15k. Some make it through a season on as little as 5k, and some spend far more! A turn-key pinto ready to race typically retails around 18-25k, while a zetec powered car tends to be about 5-10k more for an equivalent machine. Project cars have been seen changing hands for under $7000 dollars, so the approach is up to you! The class is supported by professional shops and arrive-and-drive programs are available. Ford Zetec powered cars must run an additional 50 lbs of ballast, for a total post-race minimum of 1250lbs. 1995 and earlier cars will be classed as CFC, unless the driver opts to be classed with FC. This selection must be made in advance of the race weekend. Points earned may not be carried back and forth between classes. Competitors must register with the series. Series registration fee is currently $50 annually.